Price includes lunch and a copy of "Blood Defense." California native Marcia Clark is the author of Guilt by Association, Guilt by Degrees, Killer Ambition, and The Competition, all part of the Rachel Knight series. A practicing criminal lawyer since 1979, she joined the Los Angeles District Attorney's office in 1981, where she served as prosecutor for the trials of Robert Bardo, convicted of killing actress Rebecca Schaeffer, and, most notably, O. J. Simpson. The bestselling Without a Doubt, which she co-wrote, chronicles her work on the Simpson trial. Clark has been a frequent commentator on a variety of shows and networks, including Today, Good Morning America, The Oprah Winfrey Show, CNN, and MSNBC, as well as a legal correspondent for Entertainment Tonight. 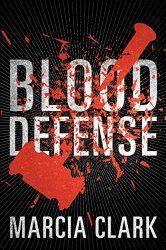 Each guest to receive a copy of Blood Defense, the first book in the Samantha Brinkman series. Samantha Brinkman, an ambitious, hard-charging Los Angeles criminal defense attorney, is struggling to make a name for herself and to drag her fledgling practice into the big leagues. Sam lands a high-profile double-murder case in which one of the victims is a beloved TV star—and the defendant is a decorated veteran LAPD detective. It promises to be exactly the kind of media sensation that would establish her as a heavy hitter in the world of criminal law.